Please note that this video has explanatory captions which are only visible if viewed on a desktop computer. You will not benefit from the explanation if you view on a mobile device. The video shows one of the simultaneous green junctions in Assen. 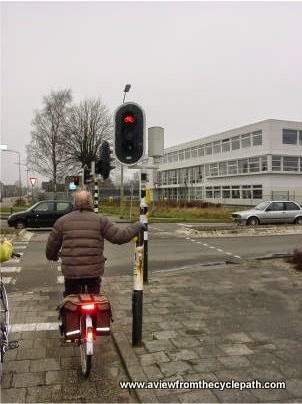 At junctions like this, which are increasingly common in the North of the Netherlands, cyclists travelling in all directions are given green lights at once and can cross in any direction including diagonally. While cyclists cross, the junction holds all motor vehicle traffic behind red lights. Therefore all conflict between bikes and cars is removed. Simultaneous Green junction. Cyclists go in all directions at once, and while the lights are green for bikes, all motor vehicles have red lights. Complete safety, as well as convenience and speed for cyclists. Simultaneous Green also can be combined with other measures. At this particular junction cyclists can make conflict free right turns against a red light at three of the four corners. On one corner of the junction it is also possible to make a left turn against a red light without conflict. Note how even large trucks can pass through the junction without causing any concerns to cyclists because cycles are separated from motor vehicles in both time and space. Dutch roads are engineered to remove conflict. This is a large part of the reason why it is that cycling is subjectively safe enough that cycling is a common activity for all age groups. In the video you'll see many adults and children, and also disabled people using the cycle paths. None feel threatened. They do this not because of a false feeling of safety - the high subjective safety that they feel is backed up by conditions which make Dutch cyclists the safest in the world even if in many cases they are groups of distracted teenagers, people making telephone calls as they cycle, or whatever. Drivers are not permitted to use cycle paths, and cyclists are not permitted to use these roads. This is something which people from other countries who don't understand often object to. However, in situations like this there is simply no gain to be had by riding on the road. The delays here for cyclists are not so short as in the example which I showed a few days ago. Here, cyclists and drivers have the same timings at the traffic lights and are delayed equally. However, cyclists actually have a significantly shorter average delay than drivers because only cyclists can make some of their turns without stopping at all. If you were to ride on the road then you would on average have to wait longer than if you used the cycle path. It is quite clear where the desire is: cycle paths sometimes have barriers to stop drivers from using them but roads don't have barriers to stop cyclists. There are many examples on this blog of places where cycling infrastructure improves speed for cyclists vs. drivers. The number of cyclists shown in the video is typical for an average morning in April. I tried counting, but it's rather difficult to do so. There are in any case over a hundred bikes in the first five minutes. Some times of day are more busy, some less so. Assen is quite a small city, with only 65000 residents, but on average they make over 70000 journeys each day between them. How the junction was at the start of 2007.
futuristic. Don't campaign for this old design. location since the junction was improved. While this video and blog post illustrates one junction, the pleasant conditions it creates for cyclists are not atypical but the norm. There is no need for everyday cycling to be a competition for inadequate space or a fight for dominance. It is not necessary that cycling should be about being strong enough (physically and mentally) to take on the roads, nor is it necessary that cyclists should need to be confident enough to "take the lane" to prevent larger vehicles from causing danger. Cycling does not have to be an extreme sport. Rather, for most trips, most of the time, cycling should merely be a way of getting to your destination, quickly, safely and without stress. That's what it's like here. Finally, if you're thinking that this road is much wider than roads in your own country, you're probably wrong. This street, Groningerstraat, is actually the same width as a road in Cambridge in the UK which is supposedly "too narrow" for proper cycle provision. The excuse of "we don't have enough room" is rarely, if ever, actually true. The Dutch find space for bikes, no matter what the width of the road. In fact, this junction itself shows an example of this. The Western side is more cramped than the Eastern side, but both sides work as well as they can for cyclists, given the available space. It's perhaps of interest that transforming this junction cost just €32K from the cycling budget. Transforming the entire road was not very expensive either by the standards of other countries. Not only is the Dutch budget for cycling larger than in other countries, it's also spent far more efficiently than in other countries. As well as matching the expenditure level, the efficiency also needs to be matched if you want to "catch up" with the Dutch. This new video shows the same junction as at the top of this post from the point of view of a cyclist travelling from the South West to the North East of the junction. More examples of what works. This simultaneous green is the first Barnes dance I've seen for bicyclists. If places with poor quality separated cycle lanes - i.e. not really physically-separated at the crossroads themselves - implement these types of crossings many people on bikes will naturally feel the urge to cross or turn with the cars. So, adding new signals with new functions is not enough. On my wide street - a crosstown boulevard in Berlin - there are cyclist signals only in two directions but they are mainly just so cyclists can see the green - as all they do is give this green to people on bikes two seconds earlier than the green for people in motor vehicles. Right now this intersection is designed for two-step left turns for people on bikes, though they are also allowed to move like motor vehicles, which makes a lot of sense at night when there a few of them around and they can be seen easily because of their headlights. How come this crossroads is not a roundabout? I wouldn't call this peace as long as motor vehicles continue to emit exhaust gases -- actually have you blogged about the risks of particles and so to people cycling even on separated paths? Dutch utility bikes are slow up hills ? The Aussies are coming, the Aussies are coming ! How much does it cost to park a car ?